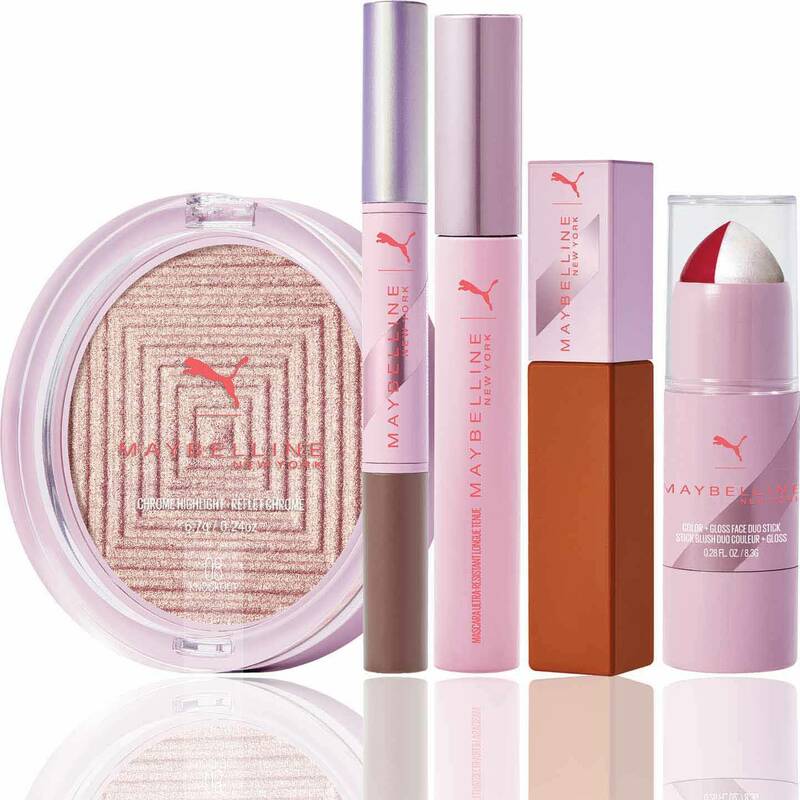 Part of the exclusive Puma x Maybelline collection, this game changing mascara goes beyond the distance to deliver budge and smudge-resistant lashes that last for up to 24 hours. Be on top of your game with this high performance mascara! It delivers clean volume and dramatic length that lasts up to 24 hours. No matter what’s on your AM-to-PM routine, look to this high-endurance mascara that that won’t budge or smudge day or night. Bring on smudge resistant and voluminous, lengthened lashes that last for up to 24 hours of wear. Step 1. Apply this non-clumping mascara from your outer to inner lashes with smooth strokes. TIP – Easily remove by splashing the eye area with warm water and softly massage to remove or apply makeup remover to a cotton square to lift off the eye area. G684744 INGREDIENTS: AQUA / WATER, PROPYLENE GLYCOL, STYRENE/ACRYLATES/AMMONIUM METHACRYLATE COPOLYMER, POLYURETHANE-35, CERA ALBA / BEESWAX, SYNTHETIC FLUORPHLOGOPITE, GLYCERYL STEARATE, CETYL ALCOHOL, PEG-200 GLYCERYL STEARATE, ETHYLENEDIAMINE/STEARYL DIMER DILINOLEATE COPOLYMER, COPERNICIA CERIFERA CERA / CARNAUBA WAX, STEARIC ACID, PALMITIC ACID, ETHYLENE/VA COPOLYMER, ALCOHOL DENAT, PARAFFIN, AMINOMETHYL PROPANEDIOL, GLYCERIN, HYDROXYETHYLCELLULOSE, PHENOXYETHANOL, CAPRYLYL GLYCOL, BUTYLENE GLYCOL, XANTHAN GUM, SODIUM LAURETH SULFATE, DISODIUM EDTA, MYRISTIC ACID, TETRASODIUM EDTA, PENTAERYTHRITYL TETRA-DI-T-BUTYL HYDROXYHYDROCINNAMATE, POTASSIUM SORBATE, SILICA. [+/- MAY CONTAIN: CI 77491, CI 77492, CI 77499 / IRON OXIDES, CI 77007 / ULTRAMARINES, CI 77891 / TITANIUM DIOXIDE, MICA, CI 75470 / CARMINE, CI 77288 / CHROMIUM OXIDE GREENS, CI 77742 / MANGANESE VIOLET, CI 77510 / FERRIC FERROCYANIDE]. F.I.L. D222913/2. This high performance mascara really goes the distance with up to 24-hour wear, smudge-resistant, clean volume and powerful length. MATTE + METALLIC EYE DUO STICK Dual-ended, crease-proof eye colour that lasts up to 24 hours. Matte. Metallic. Major.